Our mission is to provide Quality, Selection, Efficiency and Customer Service. No one has a better selection of in-stock natural stone than Tutto Marmo. With over 250 types of stones and literally thousands of slabs to choose from, Tutto Marmo is the only source you need. With a 40,000-sq-ft in door showroom you’ll find quality and selection with outstanding service. 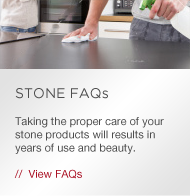 Tutto Marmo can help make certain your stone choices fit all aspects—and all areas—of your life. From rare exotic stones to sophisticated granites…to unconventional limestone, slate, and travertine…to traditional marble used in untraditional ways, the choices and selection are awe-inspiring. Whether you bring your own personal design professional or let our staff guide you, be assured that the stone you need for your home of tomorrow is today at Tutto Marmo!